William, Davis, John C. Breckinridge: Statesman, Soldier, Symbol, (Baton Rouge: (Louisiana State University Press, 1974). Gienapp, William E.Abraham Lincoln and the Border States (Journal of the Abraham Lincoln Association, 1992). Hays, Roy, Is the Lincoln Birthplace Cabin Authentic,(Abraham Lincoln Quarterly, September 1948). Heck, Frank,Proud Kentuckian, John C. Breckinridge, 1821-1875,(University Press of Kentucky, 1976). Kirwan, Albert D., John J. Crittenden: The Struggle for Union. 1962, (Greenwood Press, 1974). Townsend, William H., Lincoln and the Bluegrass: Slavery and the Civil War in Kentucky, (University Press of Kentucky, 1989). Woodard, David E., Abraham Lincoln, Duff Green, and the Mysterious Trumbull Letter, (Civil War History, September 1996). Harrison, Lloyd H., Journal of the Abraham Lincoln Association, 1992, (University of Kentucky Press, 2000). Ledbetter, Patsy S., John J. Crittenden and the Compromise Debacle, (Filson Club History Quarterly, April 1977). McMurtry, R. Gerald, The Kentucky Lincolns on Mill Creek, (Hardin County Historical Society, 1999). Sculle, Keith A., Interpreting the Lincoln Memorial Landscape at Hodgenvillle, Kentucky: The Howell Family Heritage, (Journal of the Abraham Lincoln Association, Summer 2003). Speed, James, of Abraham Lincoln and Notes of a Visit to California, (John F. Morton & Co., 1984). Townsend, William H., Lincoln and His Wife's Home Town, (Bobbs-Merrill, 1929). Warren, Louis A., Lincoln's Parentage & Childhood;: A History of the Kentucky Lincolns Supported by Documentary Evidence, (Century County Publishing, 1926). Warren, Louis A., Three Generations of Kentucky Lincolns, (Filson Club Quarterly, April 1938). Mr. Lincoln’s birthplace didn’t even show much enthusiasm for his presidential prospects in 1860. On the first ballot of the Republican National Convention in Chicago in May, Kentucky gave 8 votes to Salmon P. Chase, 6 votes for Lincoln, 5 for William H. Seward, 2 for Benjamin F. Wade, 1 for John McLean and 1 for Charles Sumner. On the second ballot, Mr. Lincoln led with 9 votes to 7 for Seward and 6 for Chase. On the third vote, Mr. Lincoln had 13, Seward 6 and Chase 4. Crittenden rolled out his compromise plan on December 18. Congressman John J. Crittenden was a Washington institution, having served as a Kentucky Senator in four separate terms, the last one ending in 1861. Having succeeded Henry Clay in the Senate, Crittenden sought a congressional compromise to avoid secession in 1860-61 by protecting slavery in the South. He had helped organize the Union Party candidacy of John Bell in 1860 from remnants of Whig and American Parties. He was something of a political vagabond having also served as a governor of Kentucky and U.S. attorney general under Presidents William Henry Harrison (1841) and Millard Fillmore. He ended his life serving in the House of Representatives from 1862 until his death in 1863. He enjoyed whiskey, cigars, and card-playing. As outgoing vice president, John C. Breckinridge had the responsibility to proclaim Abraham Lincoln as the winner of the 1860 presidential election. Before the War, Breckinridge had been a lawyer, army officer in the Mexican-American War and member of Congress. He had hoped to avoid secession but eventually abandoned the Union. At the end of December 1860, Breckinridge issued a call for a convention of the border states of Delaware, Maryland, Virginia, Tennessee, North Carolina, Kentucky and Missouri to search for a solution to the secession crisis, but the proposal was stillborn. Historian William C. Davis wrote: “As the appointed day for counting the electoral votes approached, Breckinridge, according to rumor, would tamper with them to somehow defeat Lincoln or disrupt the election. The vice-president met with General Winfield Scott to discuss the rumors, as well as the general danger of violence, and pledged that he would do his best to maintain peace. ‘His word is reliable,’ said Scott. Still Breckinridge’s declaration that all the votes were safe and intact did not quell speculation.”30 On February 12, Breckinridge did his duty without a hitch. With President Lincoln’s inauguration the next month, Breckinridge took up new duties. During the spring and summer of 1861, Breckinridge remained in Washington as one Kentucky’s senators. Illinois Congressman Isaac N. Arnold later wrote: “His fellow traitors from the slave states had all gone. He alone lingered, shunned, and distrusted by all loyal men, and treated with the most freezing and formal courtesy, by his associates. Dark and lowering, he could be daily seen in his carriage – always alone – driving to the Senate chamber, where his voice and his votes were always given to thwart the war measures of the government. It was obvious that his heart was with his old associates at Richmond.”31 Breckinridge was eventually expelled from the Senate and narrowly avoided arrest; he served a Confederate Army general with commands in both the West and East. “I also believe that some arms have been furnished to this force by the United States. Joshua F. Speed, meanwhile, continued to act as Mr. Lincoln’s unofficial agent in the state – and agent for complaints to Mr. Lincoln from fellow Kentuckians. In early September, Speed wrote the President from Cincinnati, Ohio, about relations with Union military commander Robert Anderson and the governors of states north of the Ohio River: “I am here to see Anderson on Kentucky matters – We are pretty well assured that Tennessee [sic] has had her spies in the Southern counties of Illinois, Indiana and Ohio – to see what disaffection to the Govt there is and whether those States are in a condition to render the Union men in Kentucky any assistance – should the South make an advance on Kentucky – ” Speed went on to complain about the recent proclamation by General John C. Frémont to emancipate slaves in Missouri. Ten days later, Speed forwarded a message from three fellow Kentuckians: “There is not a day to lose in disavowing emancipation or Kentucky is gone over the mill dam – ” 57 By mid-September, President Lincoln had ordered revocation of the Fremont’s proclamation. Meanwhile, President Lincoln effectively outmaneuvered Governor Magoffin by avoiding federal interference in Kentucky. Kentucky was given no excuse to succeed. “By late August the Confederate supporters had become the state’s strongest advocates of continued neutrality,” wrote Harrison. 58 When Confederates march into Columbus, Kentucky in early September, they provided the excuse for the Union forces to take Paducah. Unionists had sufficient control of the state legislature that they were able to override a gubernatorial veto of their demand for the withdrawal of Confederate troops. Union supporters were in effective control of the state. Maine Congressman James G. Blaine was more kind when he later described Wickliffe as “a man of ability, of commanding appearance, of high character.” 78 Whatever his faults, Wickliffe was a Unionist. After Mr. Lincoln’s election, Wickliffe had urged “a grand Mass Convention of all Kentuckians opposed to the present division movement…”79 Lincoln aide John Hay wrote an anonymous newspaper dispatch in December 1861 in which he observed: “Kentucky was never better represented in the House. Gov. Wickliffe made a most charming little speech to-day, which he called an obituary notice of his late colleague, [Henry C.] Burnett, who has set up a traveling government for Kentucky, and assumed the style of a peripatetic Governor. Burnett was a very stupid rebel and a bore in the House. He was never amusing, except when he rose, as he did every day, ‘solemnly to protest.’ He was a slow-blooded, pig-face nuisance, who looked more like a dropsical tallow-chandler of weak mind than a revolutionist.”80 Burnett was expelled from Congress on December 3, 1861. Mr. Lincoln had reason to be disappointed in Wickliffe. In the spring and summer of 1862, Mr. Lincoln had made a concerted effort to get Border State congressmen to support his plan for compensated emancipation. Wickliffe chaired the majority group of Border State congressman which rejected Mr. Lincoln’s proposal. They concluded in a letter to President Lincoln in July that his “resolution [was] the utterance of a sentiment, and we had no confidence that it would assume the shape of a tangible, practicable proposition, which would yield the fruits of the sacrifices it required. Our people are influenced by the same want of confidence, and will not consider the proposition in its present impalpable form. The interest they are asked to give up, is to them of immense importance, and they ought not to be expected, even to entertain the proposal, until they are assured, that when they accept it, their just expectations will not be frustrated. We regard your plan as a proposition from the Nation to the States, to exercise an admitted constitutional right in a particular manner, and yield up a valuable interest; Before they ought to consider the proposition, it should be presented in such a tangible, practicable, efficient shape, as to command their confidence, that its fruits are contingent only, upon their acceptance. We cannot trust any thing to the contingencies of future legislation. If Congress, by proper and necessary legislation, shall provide sufficient funds and place them at your disposal, to be applied by you, to the payment of any of our States or the citizens thereof, who shall adopt the abolishment of slavery, either gradual or immediate, as they may determine, and the expense of the deportation and colonization of the liberated slaves, then will our States and people take this proposition into careful consideration for such decision as in their judgments is demanded by their interests, their honor, and their duty to the whole country.”83 As a consequence of this rejection, President Lincoln proceeded with his plans to issue a draft Emancipation Proclamation in September. While President Lincoln was preparing his proclamation, Confederate troops were invading Kentucky – capturing Lexington and Frankfurt and sending the Union government in flight to Louisville. Union forces checked the Confederate advance sufficiently at Perryville on October 8, 1862 to convince the Confederate commander to abandon the campaign – without achieving his aim to recruit thousands of new Confederate soldiers. The Confederates turned back to Tennessee. Pugnacious and pugilistic, sharp-tongued and sharp-penned, Clay organized the Strangers’ Guard in the nation’s capital at the beginning of the Civil War in 1861. Clay was subsequently appointed minister to Russia after he objected to appointment as minister to Spain; he soon returned to America to accept a commission as a Union general. Despite his notable lack of common sense, humility or diplomatic skills, Clay sought reappointment as minister to Russia as quickly as Simon Cameron tired of this job. President Lincoln obliged him again. This time, Clay stayed in the Russian post until 1869. 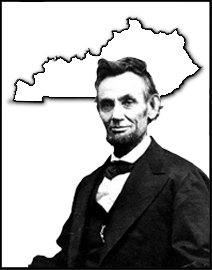 “Be assured of one thing however, that whatever men can accomplish in old Kentucky, in the great, and as I honestly believe, good cause in which we are engaged, will be accomplished. Nothing shall be left undone that can be done, to restore our whole country to that moral status when human slavery shall no longer be known among us. Joshua Speed believed early in the war that Holt should return to his old job as secretary of war, but that job went instead to Edwin Stanton in early 1862. It wasn’t until September 1862 that Holt got his reward as judge advocate general. His job entailed overseeing military justice – including preparing presidential pardons and thus required spending a good deal of time with President Lincoln. Historian Mark Neely wrote that “Holt was a loyal Kentuckian who retained an unflinching hatred for reels and traitors, but he was also a punctilious lawyer and military administrator who repeatedly overturned the decisions of trials by military commission (as well as courts-martial) for what can only be called legal technicalities.” 111 According to Leonard, “In Lincoln’s eyes, at least, Holt was the ideal man for this demanding job – an unswerving and apparently tireless Unionist, a brilliant legal mind and a man known for being thoroughly honest.”112 Holt’s name was often considered for potential appointments – including that of the 1864 vice presidential nominee. Holt was apparently offered the position as attorney general, but rejected it so Mr. Lincoln turned to another Kentuckian he knew well – James Speed. Alexander K. McClure, Lincoln’s Own Yarns and Stories, p. 17. David E. Long, The Jewel of Liberty, p. 255. Roy P. Basler, editor, Collected works of Abraham Lincoln (CWAL), Volume IV, p. 511 (Letter to Jesse W. Fell, Enclosing Autobiography, December 20, 1859). David Herbert Donald, “We Are Lincoln Men” Abraham Lincoln and His Friends, p. 45. Albert Beveridge, Abraham Lincoln , Volume I, p. 320. David Herbert Donald, “We Are Lincoln Men” Abraham Lincoln and His Friends, p. 46. David Herbert Donald, “We Are Lincoln Men” Abraham Lincoln and His Friends, p. 47. Albert Beveridge, Abraham Lincoln,, Volume I, p. 321. CWAL, Volume I, pp. 259-261 (Letter from Abraham Lincoln to Mary Speed, September 27, 1841). CWAL, Volume II, p. 320 (Letter from Abraham Lincoln to Joshua F. Speed, August 24, 1855). Katherine Helm, The True Story of Mary, Wife of Lincoln, pp. 99-102. William L. King, David Davis: Lincoln’s Manager, p. 58. William H. Townsend, Lincoln and the Bluegrass: Slavery and Civil War in Kentucky, pp. 132-133. William H. Townsend, Lincoln and the Bluegrass: Slavery and Civil War in Kentucky, p. 134. William H. Townsend, Lincoln and the Bluegrass: Slavery and Civil War in Kentucky, p. 213. Louis A. Warren, The Slavery Atmosphere of Lincoln’s Youth, p. 97. Abraham Lincoln Papers at the Library of Congress. Transcribed and Annotated by the Lincoln Studies Center, Knox College. Galesburg, Illinois. (Letter from Joshua F. Speed to Abraham Lincoln, May 19, 1860). Abraham Lincoln Papers at the Library of Congress. Transcribed and Annotated by the Lincoln Studies Center, Knox College. Galesburg, Illinois. (Letter from Joshua F. Speed to Abraham Lincoln, November 14, 1860). Ward Hill Lamon, Recollections of Abraham Lincoln, 1847-1865 (Letter from Joshua Speed to Ward Hill Lamon, June 24, 1872) p. 286. Charles M. Segal, editor, Conversations with Lincoln, pp.62-63(Letter from Duff Green to James Buchanan, December 28, 1860). Albert D. Kirwan, John J. Crittenden: The Struggle for the Union, p. 386. CWAL, Volume II, pp. 483-484 (Letter from Abraham Lincoln to John J. Crittenden, July 7, 1858). Mrs. Coleman Chapman, The Life of John J. Crittenden, pp. 162-163. Saul Sigelschiffer, The American Conscience: The Drama of the Lincoln-Douglas Debates, p. 210. CWAL, Volume III, p. 335-336. (Letter from Abraham Lincoln to John J. Crittenden, November 4, 1858). Roy P. Basler, editor, Collected works of Abraham Lincoln, Volume IV, p. 199 (Speech at Cincinnati, February 12, 1861). CWAL, Volume IV, p. 200 (Fragment of Speech Intended for Kentuckians, ca. February 12, 1861) . Alexander K. McClure, Lincoln’s Own Yarns and Stories, pp. 323-324. William C. Davis, Breckinridge: Statesman, Soldier, Symbol, p. 257. Isaac N. Arnold, The Life of Abraham Lincoln, p. 223. Frank H. Heck, Proud Kentuckian: John C. Breckinridge, 1821-1875, p. 97. Elizabeth Todd Grimsley, “Six Months in the White House”, Journal of the Illinois State Historical Society 19, October-January, 1926-27, p. 57. Michael Burlingame, editor, Lincoln’s Journalist: John Hay’s Anonymous Writings for the Press, 1860-1864, p. 156 (December 3, 1861). James G. Blaine, Twenty Years of Congress, Volume I, p. 323. Carl Sandburg, Abraham Lincoln, The War Years, Volume II, p. 154. William C. Davis, Breckinridge: Statesman, Soldier, Symbol, p. 261. William B. Hesseltine, Lincoln and the War Governors, p. 159. Charles M. Walker, Sketch of the Life, Character and Public Services of Oliver P. Morton, (Letter from Thomas L. Crittenden to Oliver P. Morton, May 30, 1861), pp. 67-68. Lowell H. Harrison, Lincoln of Kentucky, p. 143. William B. Hesseltine, Lincoln and the War Governors, p. 210. Abraham Lincoln Papers at the Library of Congress. Transcribed and Annotated by the Lincoln Studies Center, Knox College. Galesburg, Illinois. (Letter from Joshua F. Speed to Abraham Lincoln, May 27, 1861). Abraham Lincoln Papers at the Library of Congress. Transcribed and Annotated by the Lincoln Studies Center, Knox College. Galesburg, Illinois. (Letter from Joshua F. Speed to Abraham Lincoln, May 29, 1861). Lowell H. Harrison, The Civil War in Kentucky, pp. 2-3. Lowell H. Harrison, The Civil War in Kentucky, p. 97. Emma Lou Thornbrough, Indiana in the Civil War Era, 1850-1880, p. 108. Kenneth Stampp, Indiana Politics During the Civil War Era, p. 113. Lowell H. Harrison, The Civil War in Kentucky, pp. 10-11. CWAL, Volume IV, p. 464 (Letter from Abraham Lincoln to the Kentucky Delegation in Congress, July 29, 1861). Michael Burlingame and John R. Turner Ettlinger, editors, Inside Lincoln’s White House: The Complete Civil War Diary of John Hay, p. 24 (August 22, 1861). CWAL, Volume IV, p. 497. (Letter from Abraham Lincoln to Beriah Magoffin, August 24, 1861). Abraham Lincoln Papers at the Library of Congress. Transcribed and Annotated by the Lincoln Studies Center, Knox College. Galesburg, Illinois. (Letter from Joshua F. Speed to Abraham Lincoln, September 1, 1861). Abraham Lincoln Papers at the Library of Congress. Transcribed and Annotated by the Lincoln Studies Center, Knox College. Galesburg, Illinois. (Letter from Green Adams and James Speed to Abraham Lincoln, September 2, 1861). Abraham Lincoln Papers at the Library of Congress. Transcribed and Annotated by the Lincoln Studies Center, Knox College. Galesburg, Illinois. (Letter from Jeremiah T. Boyle, John J. Speed, Joshua F. Speed to Abraham Lincoln, September 2, 1861). Abraham Lincoln Papers at the Library of Congress. Transcribed and Annotated by the Lincoln Studies Center, Knox College. Galesburg, Illinois. (Letter from Joshua F. Speed to Abraham Lincoln, September 3, 1861). Abraham Lincoln Papers at the Library of Congress. Transcribed and Annotated by the Lincoln Studies Center, Knox College. Galesburg, Illinois. (Letter from J. F. Bullitt, W. E. Hughes, and C. Ripley to Joshua F. Speed, September 13, 1861). Lowell H. Harrison, The Civil War in Kentucky, p. 12. Francis B. Carpenter, The Inner Life of Abraham Lincoln: Six Months at the White House, pp. 268-269. Kenneth Stampp, Indiana Politics During the Civil War Era, p. 115. Abraham Lincoln Papers at the Library of Congress. Transcribed and Annotated by the Lincoln Studies Center, Knox College. Galesburg, Illinois. (Letter from James Speed to Abraham Lincoln, October 7, 1861). Lowell H. Harrison, Lincoln of Kentucky, pp. 162-163. Lowell H. Harrison, The Civil War in Kentucky, p. 82. Eric Foner, Reconstruction: America’s Unfinished Revolution, 1863-1877, p. 37. Michael Burlingame, Lincoln’s Journalist: John Hay’s Anonymous Writings for the Press, 1860-1864, p. 191 (January 11, 1862). Michael Burlingame, Lincoln’s Journalist: John Hay’s Anonymous Writings for the Press, 1860-1864, p. 276 (June 2, 1862). Allan G. Bogue, The Earnest Men: Republicans of the Civil War Senate, pp. 47-48. Charles M. Segal, editor, Conversations with Lincoln, pp. 115-116. Abraham Lincoln Papers at the Library of Congress. Transcribed and Annotated by the Lincoln Studies Center, Knox College. Galesburg, Illinois. (Letter from Garrett Davis to Abraham Lincoln, August 4, 1861). Carl Sandburg, Abraham Lincoln, The War Years, Volume II, p. 556. Josiah B. Grinnell, Men and Events of Forty Years, p. 141. George W. Julian, Political Recollections, 1840 to 1862, pp. 357-358. Isaac N. Arnold, The Life of Abraham Lincoln, p. 246. Theodore Calvin Pease, editor, Diary of Orville H. Browning, (January 18, 1862), Volume I, p. 526. Allen C. Bogue, Earnest Men: Republicans of the Civil War Senate, pp. 45-46. Ben Perley Poore, Perley’s Reminiscences, Volume II, pp. 102-103. George W. Julian, Political Recollections, 1840 to 1862, p. 366. James G. Blaine, Twenty Years in Congress, Volume I, p. 331. Lowell H. Harrison, The Civil War in Kentucky, p. 6. Michael Burlingame, editor, Lincoln’s Journalist: John Hay’s Anonymous Writings for the Press (December 3, 1861), 1860-1864, p. 157. Theodore Calvin Pease, editor, Diary of Orville H. Browning,, Volume I, p. 541 (April 14, 1862). CWAL, Volume VI, pp. 371-372 (Letter from Abraham Lincoln to Mary Todd Lincoln, August 8, 1863). Abraham Lincoln Papers at the Library of Congress. Transcribed and Annotated by the Lincoln Studies Center, Knox College. Galesburg, Illinois. (Letter from Border State Congressman to Abraham Lincoln, July 14, 1862). George Yeaman, “Abraham Lincoln: An address before the Commandery of the State of Colorado, Military Order of the Loyal Legion of the United States”, February 13, 1899, pp. 6-7. William E. Barringer, House Dividing: Lincoln as President Elect, pp. 24-25. Paul M. Angle and Earl Schenck Miers, editors, Fire the Salute: Murat Halstead Report the Republican National Convention in Chicago, May 16, 17, & 18, 1860, pp. 48-49. Cassius M. Clay, The Life of Cassius Marcellus Clay: Memoirs, Writings and Speeches, p. 310. Cassius M. Clay, The Life of Cassius Marcellus Clay: Memoirs, Writings and Speeches, p. 312. Lowell H. Harrison, The Civil War in Kentucky, p. 89. Lowell H. Harrison, The Civil War in Kentucky, p. 83. CWAL, Volume VII, p. 109 (Letter from Abraham Lincoln to Thomas Bramlette, January 6, 1864). Lowell H. Harrison, The Civil War in Kentucky, pp. 86-87. CWAL, Volume VIII, pp. 77-78 (Letter to John R. Underwood and Henry Grider, October 26, 1864). CWAL, Volume VII, pp. 98-99 (Letter from Abraham Lincoln to Thomas E. Bramlette, November 10, 1864). Abraham Lincoln Papers at the Library of Congress. Transcribed and Annotated by the Lincoln Studies Center, Knox College. Galesburg, Illinois. (Letter from Thomas Bramlette to Abraham Lincoln, November 14, 1864). Abraham Lincoln Papers at the Library of Congress. Transcribed and Annotated by the Lincoln Studies Center, Knox College. Galesburg, Illinois. (Letter from George D. Prentice to Abraham Lincoln, October 26, 1860). Josiah G. Holland, Life of Abraham Lincoln, p. 390. Louis A. Warren, The Slavery Atmosphere of Lincoln’s Youth, p. 2. Roy P. Basler, editor, Collected works of Abraham Lincoln (Letter from Abraham Lincoln to Albert Hodges, April 4, 1864), Volume VII, pp. 281-282. Abraham Lincoln Papers at the Library of Congress. Transcribed and Annotated by the Lincoln Studies Center, Knox College. Galesburg, Illinois. (Letter from Albert G. Hodges to Abraham Lincoln, April 22, 1864). Abraham Lincoln Papers at the Library of Congress. Transcribed and Annotated by the Lincoln Studies Center, Knox College. Galesburg, Illinois. (Letter from Albert G. Hodges to Abraham Lincoln, May 10, 1864). Abraham Lincoln Papers at the Library of Congress. Transcribed and Annotated by the Lincoln Studies Center, Knox College. Galesburg, Illinois. (Letter from Albert G. Hodges to Abraham Lincoln, October 24, 1864). Noah Brooks, Inside Washington in Lincoln’s Time, p. 142. Ward Hill Lamon, Recollections of Abraham Lincoln, p. 135. Allen Thorndike Rice, editor, Reminiscences of Abraham Lincoln by Distinguished Men of His Time, p. 241 (Titian J. Coffey). Elizabeth D. Leonard, Lincoln’s Avengers: Justice, Revenge, and Reunion After the Civil War, p. 17-18. Elizabeth D. Leonard, Lincoln’s Avengers: Justice, Revenge, and Reunion After the Civil War, p. 26. Mark E. Neely, Jr., The Fate of Liberty: Abraham Lincoln and Civil Liberties, p. 162. Elizabeth D. Leonard, Lincoln’s Avengers: Justice, Revenge, and Reunion After the Civil War, p. 27. Abraham Lincoln Papers at the Library of Congress. Transcribed and Annotated by the Lincoln Studies Center, Knox College. Galesburg, Illinois. (Letter from James Speed to Abraham Lincoln, November 15, 1859). Howard K. Beale, editor, The Diary of Edward Bates, p. 483 (May 25, 1865). Michael Burlingame, editor, Lincoln Observed: Civil War Dispatches of Noah Brooks, pp. 148-149 (December 5, 1864). James Speed, Oration of James Speed Upon the Inauguration of the Bust of Abraham Lincoln, p. 3. CWAL, Volume VIII, p. 195 (Reply to Delegation of Kentuckians, January 2, 1865). Margarita Spalding Gerry, editor, Through Five Administrations: Reminiscences of Colonel William H. Crook, Bodyguard to President Lincoln, p.56. Margarita Spalding Gerry, editor, Through Five Administrations: Reminiscences of Colonel William H. Crook, Bodyguard to President Lincoln, pp. 56-57.